Red star, blue star, big star, small star–planets may form around virtually any type or size of star throughout the universe, not just around mid-sized middle-aged yellow stars like the Sun. That’s the surprising implication of two discoveries in 2006 from the 0.85-meter-diameter Spitzer Space Telescope, which is exploring the universe from orbit at infrared (heat) wavelengths blocked by the Earth’s atmosphere. At one extreme are two blazing, blue “hypergiant” stars 180,000 light-years away in the Large Magellanic Cloud, one of the two companion galaxies to our Milky Way. The stars, called R 66 and R 126, are respectively 30 and 70 times the mass of the Sun, “about as massive as stars can get,” said Joel Kastner, professor of imaging science at the Rochester Institute of Technology in New York. R 126 is so luminous that if it were placed 10 parsecs (32.6 light-years) away–a distance at which the Sun would be one of the dimmest stars visible in the sky–the hypergiant would be as bright as the full moon, “definitely a daytime object,” Kastner remarked. Such hot stars have fierce solar winds, so Kastner and his team are mystified why any dust in the neighborhood hasn’t long since been blown away. But there it is: an unmistakable spectral signature that both hypergiants are surrounded by mammoth disks of what might be planet-forming dust and even sand. Although actual planets have not been detected (in part because of the stars’ great distances), the spectra of the hypergiants show that their dust is composed of forsterite, olivine, aromatic hydrocarbons, and other geological substances found on Earth. 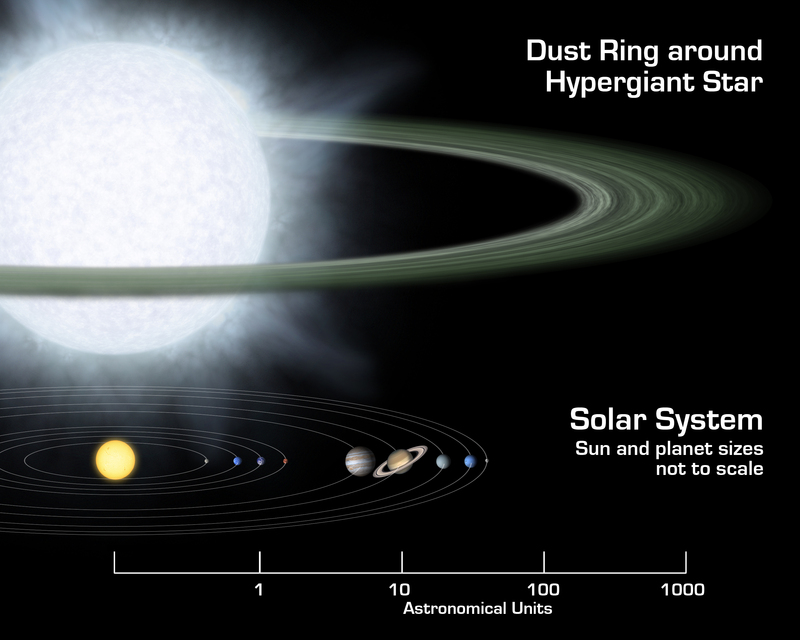 Hypergiants and dwarfs? The Milky Way could be crowded with worlds circling every kind of star imaginable–very strange, indeed. Keep up with the latest findings from the Spitzer at http://www.spitzer.caltech.edu. Kids and their grown up friends can enjoy beautiful images from Spitzer while playing Spitzer Concentration at The Space Place (http://spaceplace.nasa.gov/en/kids/spitzer/concentration).